I had a double half today. My first half wanted to fish tarpon in the morning and then just catch fish for his wife. I took them to the main shipping channel off of Key west to see if any migratory fish has shown up. There were no fish there but I did find a school in Key west harbor. We jumped a nice 60-80 pounder but lost it on the first jump. We drifted a few spots with no luck before I tried to just bend some rods. I hit a spot that we had a chance for jack and tarpon. The jacks were all over the place, we had landed 1 after the other before I spotted several schools of tarpon. No luck on the tarpon so I switched and hit another spot for action. This spot had lady fish, sea trout, pompano, snappers and sharks. My second half, we headed east of Key west to a channel that has been good for large jacks. We hooked up several that got eaten by sharks before we landed a nice 8 pounder. We landed several more nice jacks and a large nurse shark before we headed to another spot. I hit some mullet muds and landed a few lady fish. 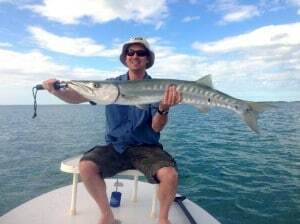 I switched gears and went barracuda fishing. We missed several nice cudas before we land a very nice barracuda. Posted by Capt. Anthony Skinner, on March 4th, 2014 at 6:56 pm.